Paraphrasing an advertising tagline from the American beef production industry, I think Bees-they’re what’s for dinner is applicable to the Summer Tanagers, Piranga rubra, who are visiting my garden. In the last month, I’ve observed at least three different Tanagers flitting around my back garden. 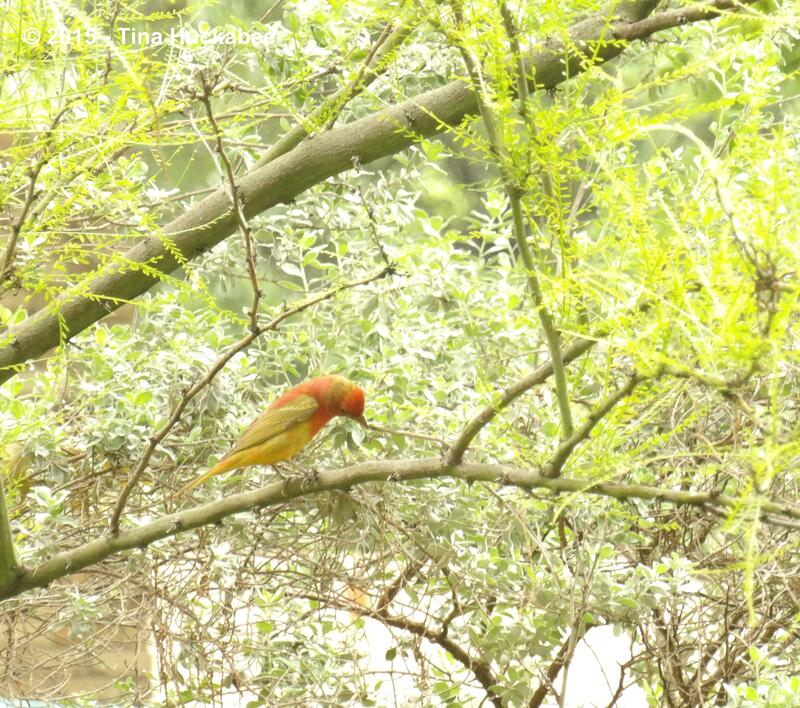 You’ll have to excuse the photos–I’ve yet to take a clear pic of any one of these stunning birds, but the male is pure bright red, the female is yellow, and the red/yellow combination is an immature male. I have no idea where they’re nesting, but these eye-poppers breed in Central Texas and surrounding areas west, south, and eastward during summer. Really? The birds and the bees? One is the hunter and one is the prey? I checked the Cornell Merlin phone app while I was watching the Tanagers that Sunday afternoon and Summer Tanagers are, in fact, bee and wasp eaters. 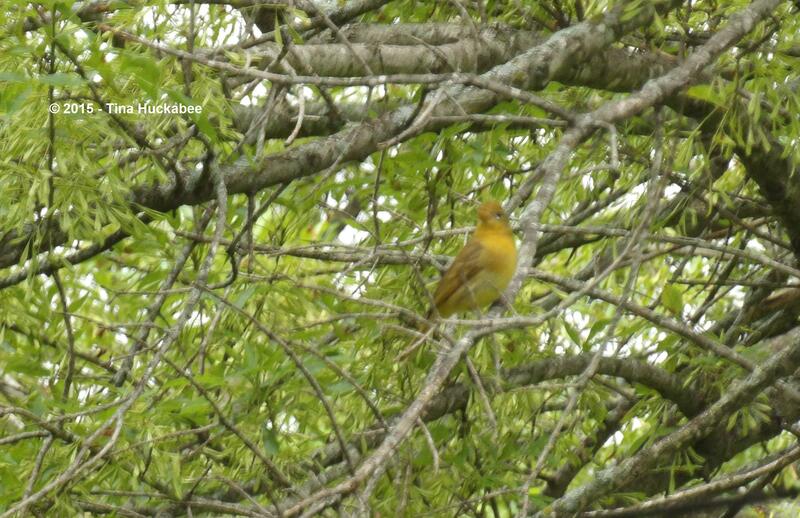 The Tanagers were landing in the Shumard just above where the honeybee hives are located. Indeed, I’ve watched them fly into the flight path of my honeybees, swooping in, then banking off sharply as if they caught something; I assume the brilliant hunter flew off to an unseen spot to eat. I’ve witnessed an immature male Tanager flutter just above a Purple Coneflower, where a native bee was hard at work nectaring. The Tanager hovered briefly, then seemingly decided that maybe honeybees were more easily picked off for a meal and he flew away. At about the time that the Tanagers were making daily, or nearly daily, appearances, I also realized that both of our honeybee queens were dead. I’m not sure what happened to the queens, as they were dutifully laying eggs at the beginning of spring. We might have accidentally rolled them during a hive check (probably) or, they might have simply died or were so weak that the worker bees decided to replace them–that happens. The previous weeks, as part of my spring beekeeper management, I’d conscientiously destroyed queen cells (that the girls insisted upon making), in order to quell their desire for procreation. I did such a good job that the ladies were left without their leaders. Beekeeping is hard. Especially when the beekeeper doesn’t know what in hell she’s doing. So I found myself in a bit of a fix: two dead queens, which means two dying hives–and Summer Tanagers gobbling honeybees on a regular basis. Even without the hunting birds, the bees are doomed if I don’t requeen both hives, and the Tanagers assure that inevitability sooner, rather than later. What to do? A quick check on the Beeweaver Apiaries website showed that they were sold out of queen bees until June. JUNE!! My hives won’t make it to June. I emailed the owner, whom I met last year, explained my predicament and she took pity on me, or more likely, my hapless honeybees. She immediately ordered two queens sent, via UPS, on an overnight shipment to me. Beekeepers stick together and help each other. The queens were to arrive on a Thursday and when they didn’t as expected, I shifted into sleuth mode to discover where my queens were stranded. UPS claimed that the package was delivered to my address at 9am. I wasn’t home at that time, but Bee Daddy was and there was no delivery of queens or anything else. I combed the neighborhood on my bicycle, searching for a misdelivered queen bee package. I received some odd looks from neighbors when I explained what I was looking for and that proved interesting. And weird. I won’t go into the details about what I did to find the package of bees, but the queens and their attendants were misdelivered that morning to an address that was one number off of mine and about ten houses away. Yes, I made a formal complaint to UPS. The hives were requeened and new bees are hatching as I write–there will be plenty of honeybees for the Tanagers to eat. WAIT A MINUTE! That’s not why I have honeybees! I have honeybees so they can pollinate my gardens and the gardens around the neighborhood. I have honeybees so that I can enjoy and share their incredible honey. 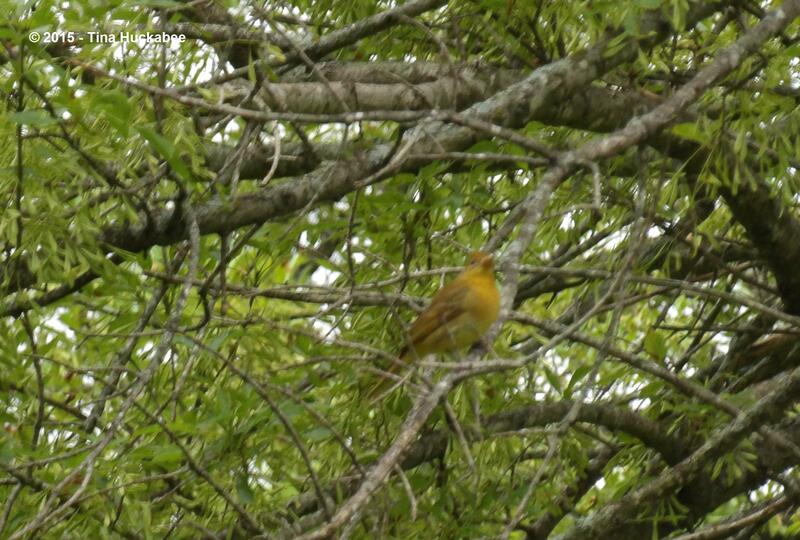 I DON’T have honeybees so the Summer Tanagers can hunt and eat them. But hunt and eat they do. One of my bedroom windows is just above where the hives are located. 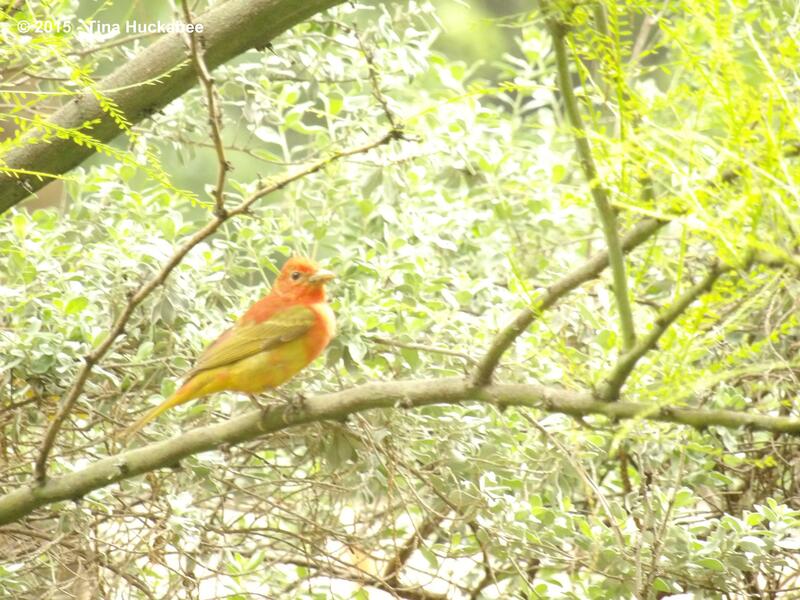 One morning recently, I opened the window to a gorgeous male Summer Tanager, perched in the Shumard, gazing hungrily down at the hives. 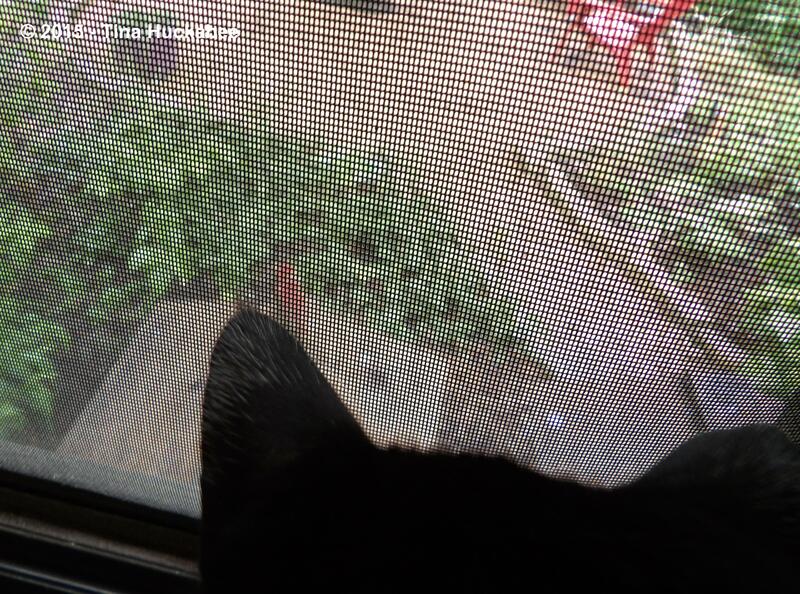 He was so intent on snagging a bee for his breakfast that he didn’t notice my movement at the window. This past Sunday morning, my little Astrud cat was staring at something as she sat on that window sill, as she often does. Can you see him through the less-than-pristine screen? The Tanager is poised on top of Scar (one of my hives). The beautiful avian scamp flew downward for a second, likely to the entry board of the hive, then flew back to the top with his prize: a honeybee in his beak for lunch. He mangled my beloved little bee and deposited her down his gullet–while perched atop the hive. That takes a certain amount of impertinence. Additionally, I have mixed emotions about witnessing the effrontery. Do I mind the Tanagers hunting the bees? No, actually, I don’t. I do feel a little sad about the hardworking foragers, toward the end of their lives, being snarfed down by the gorgeous feathered fiends. And having hives readily available is tantamount to shooting fish in a barrel. After all, it’s not even like the Tanagers have to hunt that hard. The hives are right there and the bees are coming and going constantly, with no thought to their own personal safety–the health of the hive is what drives them. Meanwhile, the Tanagers have found a pretty sweet deal. In targeting my honeybees for the benefit of their tummies, the Tanagers won’t decimate my hives. Yes, they’ll kill some and if they’re around all summer, many. But the honeybees are in much more danger from pesticide or herbicide use on a plant they might forage from than they are from the Summer Tanagers. I don’t garden with chemicals, but the bees forage within a three-mile radius–who knows what they take nectar and pollen from? The Tanagers will kill some bees, but they won’t cause either of my hives to collapse because of harmful chemicals. The balance of prey to predator won’t be disturbed–as long as all other factors remain relatively equal. Ahem. Good beekeeping practices are part of that equation. So I’m welcoming the Tanagers to my garden and consider myself fortunate to observe these fascinating and beautiful birds. I don’t see them everyday. In fact, a couple of weeks passed and I didn’t see any Tanagers. Then, saw one or two for several days–hanging around the beehives, of course. Besides bees and wasps, Tanagers also eat fruit, though I didn’t see them at the ripening blackberries. Apparently, the Tanagers have plenty to eat. Truthfully, I rather them dine on the honeybees than the native bees, since the honeybee hives are protected and have a healthy location in which they thrive. The native bees nest in and around my gardens, but they also nest elsewhere and may not always find such a tolerant and beneficent host. Beekeeping and wildlife gardening–a tricky balance with those two, but there clear advantages with both endeavors and my garden and the surrounding environment are the winners. I’m sure the bees are delicious to the Tanagers, but I think I’ll stick to eating honey. 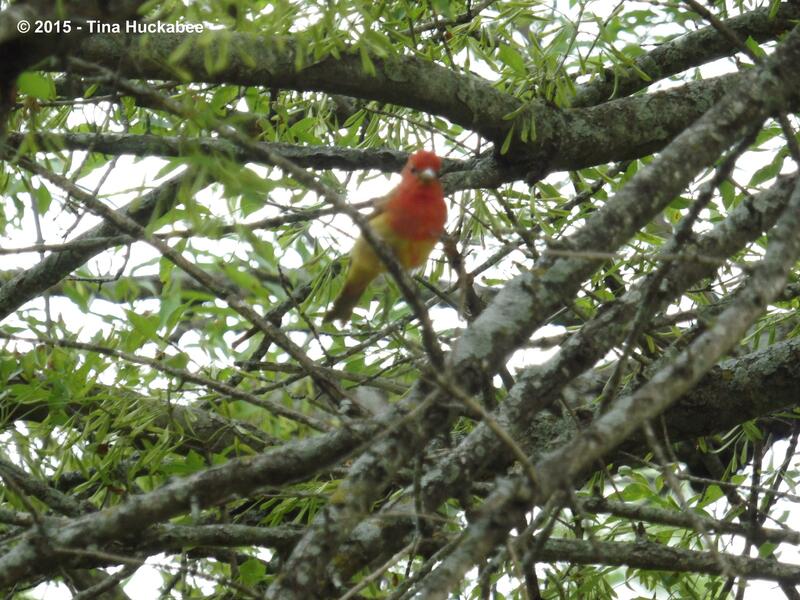 This entry was posted in Beekeeping, Wildlife, Wildlife Gardening and tagged Honeybees, Native Bees, Piranga rubra, Summer Tanager by Tina. Bookmark the permalink. I love it – you on your bicycle going door to door in search of your mis-delivered queen bees reads like something out of a Wes Anderson movie. I’m glad the queens were located and re-hived, and agree – it is best if the beleaguered native bees aren’t tops on the tanager’s menu. So many of our locals are ground dwellers and while I’ve seen a few adult native bees out foraging since our last heaviest rains, I can’t help but wonder if they lost a generation of bees-to-be in all the recent (and repeated) flooding. Your attitude is commendable and one I hope to emulate as my soggy garden looks to be overtaken by various biting and leaf munching visitors of the non-turning-into-butterfly kinds. There is a rough balance to be struck and I’m coming to accept that balance depends very little (if at all) on my efforts to intervene! Oh my, you’re right. I’m straight out of a Wes Anderson movie, without the quirky music. I’ve become that eccentric woman predicted by many. Snort. I need to check my honeybees, but haven’t quite had the time, in between the rains, to do it. But as best I can tell, all is good. And I’ve wondered the same about the native bees. I haven’t seen any of the little metallic/sweat bees since our floods and they’re ground nesters. Sniff. There are a variety of the mason and carpenters around, but yeah, I’ll bet those nests were drowned out. In looking at the gardens, specifically foliage, there are lots of eating critters at work, their populations no doubt increasing with our rain and warm temps. I spy lots of holes on plants that don’t normally have them (like the blue mistflower), though others, like the Gregg’s mistflower are just fine. Like many, I’ve had some issues with that darned four-lined bug, but my main problems are due to aphids. They are devils. Glad your hives are re-queened and doing well. 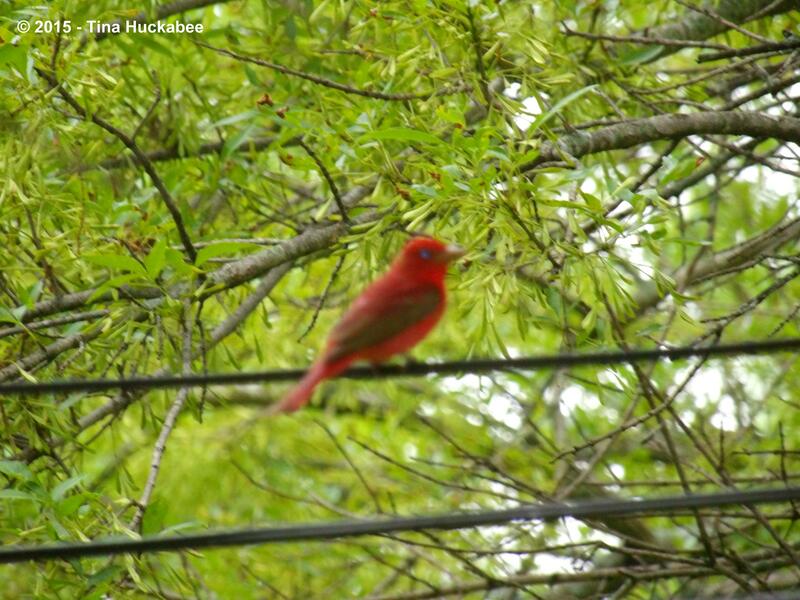 Those tanagers are beautiful birds, even if they are a bit of a nuisance! It’s been a treat to see them–they are absolutely gorgeous birds. What a good save on those queens! Yup, new beekeeper ineptitude is a good reason for regular hive checks…. A fascinating post. The tanagers are beautiful. Who would have thought they would eat bees? Odd that they don’ t get stung. What a wonderful sight they must be. Great you have your queens and healthy hives. Thank you, Chloris–glad you liked it. The tanagers are beautiful. I wish everyone could see one in person. I read that that they catch the bee or wasp, hit it (oh!) on a branch (or the top of a bee hive…), remove the stinger, gulp. I’ve learned how to pick up bees with my hands, though I’ve occasionally received a sting. If you pick up the bee directly from the top, gently pinching both wings together, she 1) can’t sting, because she can’t curl around enough for the stinger to hit its mark, and 2) by holding both wings together, you don’t damage either wing. A constant balancing act, yes. 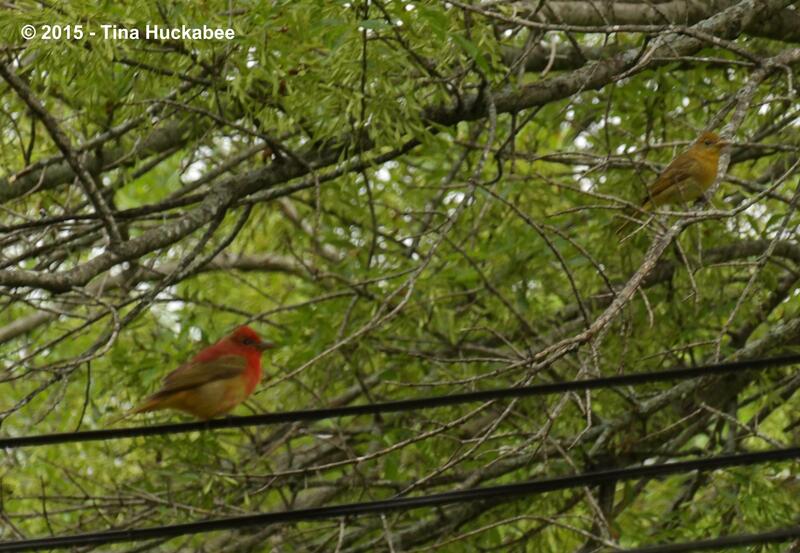 Lucky you to have Tanager visitors! I didn’t realize they would eat honeybees either. Sometimes I’m amazed at what hummingbirds and other tiny songbirds will eat. 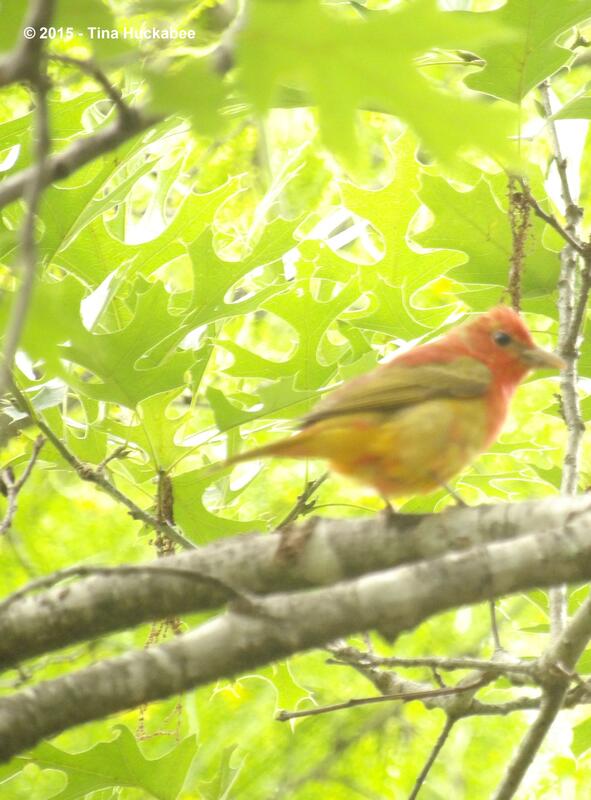 I do feel lucky to see the tanagers from time to time–so gorgeous, even if they eat my honeybees. These critters are resourceful, I guess they have to be, in order to survive. I really enjoyed this post, Tina. I liked the thought way you described the situation and your feelings about it. I agree with you bees, and other insects, animals etc. suffer more at our hands through pesticides than from any natural predator. We have African bee eaters that arrive here in May or June, in fact they eat other insects too, not just bees. They are iridescent blue and orange, they fly quite high in the sky so I’ve never managed a photograph. Your tanagers are beautiful, perhaps if you put some fruit out for them to eat they would eat fewer bees. 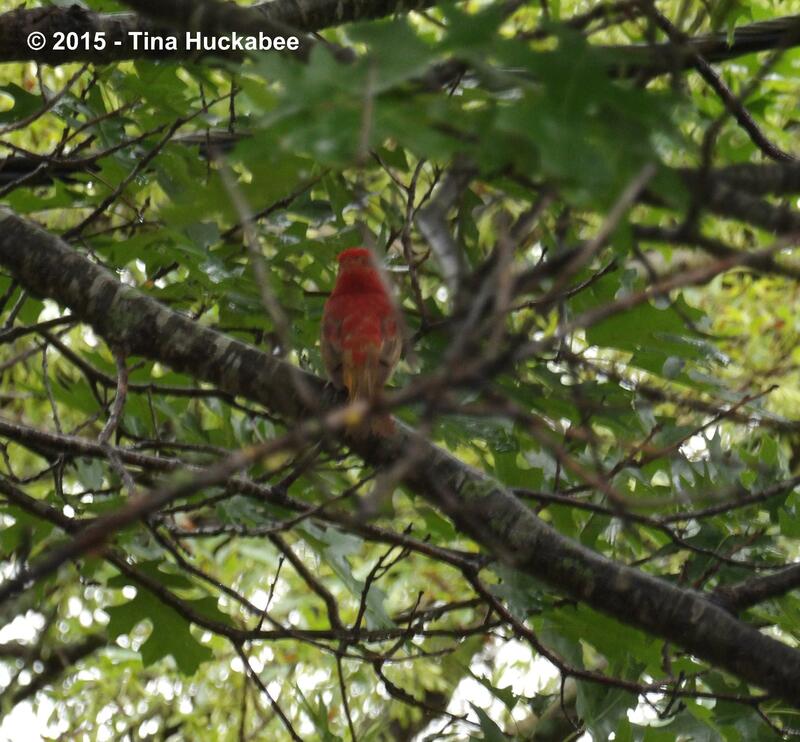 Thanks Christina–it’s been a joy to have these birds visit. I think many people forget, or don’t realize than nothing in nature exists in a vacuum–all “things” are interconnected through a web. You can’t negatively target one thing, like an insect, without incurring issues for other creatures/plants that are part of the food chain. Your birds are gorgeous–I just looked up photos/information! It’s hard to photograph birds, I’ve decided. They just won’t sit still long enough. 🙂 What a special treat to watch unusual bird visitors when their meal-of-choice is available. I might try the fruit–it would be interesting to see if they visit. One reason I don’t use chemicals in the garden is because I really want the garden to be in equilibrium. That of course was the problem of my boxwood. Because it is a moth that comes from Asia, here there are no natural predators stopping its progress, that was why I decided to remove it rather than resort to chemicals. In summer especially when the lavender flowers there is a constant hum from all the pollinators that visit the garden, I would hate losing that sound, so do all I can to provide pollen and nectar for all the visitors. Good for you, Christina!! I wish more would make the same decision. I do think there is greater awareness of the harm of using chemicals as widespread as they are. Certainly, here in the States, I find many homeowners grab the first bottle of whatever to spray, with little or no understanding of the ramifications of possible negative effects from the chemical use. wonderful wonderful post – thank you! You just show how everything is interconnected. But the birds eating the bees… I am amazed and sorry all at the same time. Everything has to eat. Nice in theory. Sometimes I am not so happy about it…..
Well, it is a mixed blessing, hosting bees and tanagers. Tina how lucky to have the Tanagers…I love this bird and have only seen them at our Nature Center…and I too loved the post as you explain the balance of things….glad the hives are thriving. I’ve enjoyed seeing them this spring, though it’s been about a week since since they’ve been around. They are spectacular. Your tanagers are such beautiful and bright birds. I’ve not yet seen any in my garden. Then again, I don’t have a bee buffet for them to chow down on. I’m glad you were able to hunt down your lost queens with your exceptional detective skills, and great to hear that they are already producing more baby bees for future pollinators of your garden. I’ve thought bee-keeping would be a fun and helpful addition to my garden. But your blog has educated me on how tricky it can be, so I’ll just enjoy the native bees for now and maybe revisit the idea later in life when I have more time on my hands. The tanagers have been a real treat–I hope they return. As for the beekeeping, it is labor intensive at points during the year, but not all the time. Part of what makes our beekeeping difficult is that we have Warre hives and they’re hard to work with. If all goes well, next spring, we’ll hive bees into two new Langstroth hives–that should lessen our bee trauma a bit. Whew – what a relief that your hives were saved. I have never had Tanagers show in our garden – such a beautiful bird! Hard to imagine that they can do much damage by eating honeybees. And yes, I’m glad we were able to requeen so soon after the the old queens were kaput. Well, they really don’t do damage–bees and wasps are simply what tanagers (of all sorts, I think) eat. The real problem is that there’s so much out-of-wack in nature that any “die off” can pose problems. What a girl will do for here bees! Of course they are your babies and in your charge. 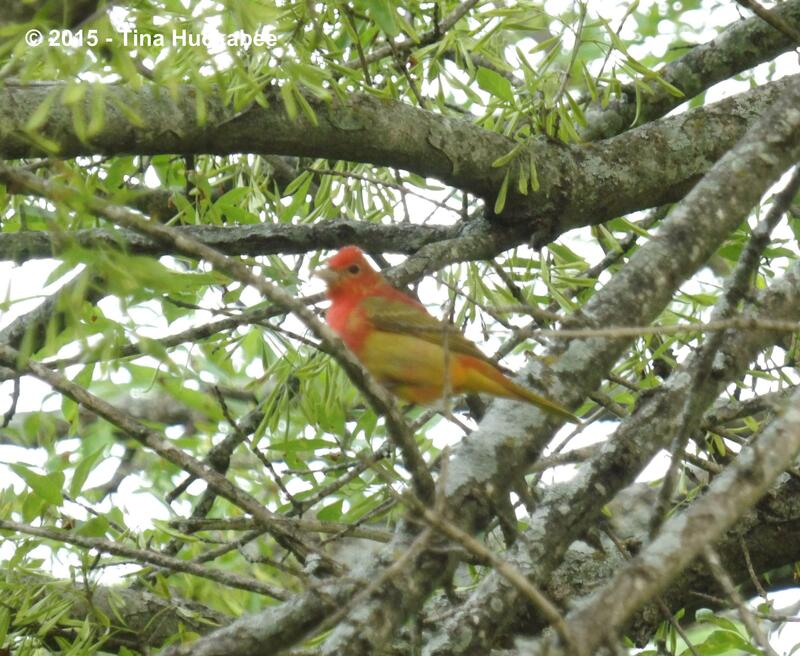 I was thrilled to see your photo of the summer tanager because we had one in our garden the other day. Never managed a photo but we got out the bird book and I did a video of the song. We were almost positive of the ID but you have confirmed it. Nice that you have a tanager visiting!! Aren’t they just gorgeous? They’re hard to get photos of (at least, for me) because they don’t sit still for long enough. But such treats to have in the garden–even if they do find my bees yummy. I do love my little honeybees. It’s time, once again, for another peek into the hive, but they’ve sure enjoyed the sunny days lately. These are such beautiful birds. SO beautiful. I would consider a hive just to attract them. Honeybee queens ain’t cheap. 🙂 And, I love my hives, so, of course I’d track them down to the best of my ability. Arent’ those birds just fabulous? I haven’t seen any now in about 10 days, so they may have moved on, but I think with the hives, they may be regular spring visitors. Yay!